There must be something in the soil because the fruits are out of control and are creating chaos in the garden. Click here to play! See if you can wrangle these seedy characters and you might just pick up some bountiful rewards! You’ll need a basket to gather all of the unruly fruit, so spin in the wicker container as much as possible. It is a wild symbol and will substitute for most others to help you create even more winning combinations. 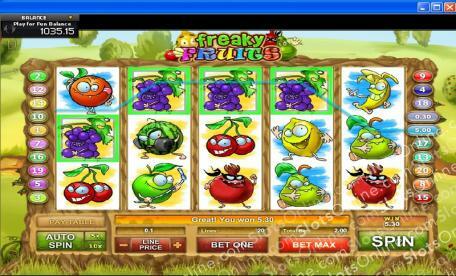 Then set about collecting all of the different fruit characters. There are cherries, grapes, oranges, pears, apples, bananas, pineapples, pomegranates, melons, and lemons. Each holds a top payout worth 200 times your line bet if you can spin five of them across an active payline. You’ll also want to watch out for the earthworms in your quest to bring order to the gardens. These little guys will help you get the soil back under control, so spin as many as possible because they’re a bonus symbol. Spin three or more and you’ll trigger the worm race bonus feature in which you can win even more cold hard cash! Can you bring order to the fruit? Spin the reels to find out and you might just walk away with a handsome reward. The fruit basket is a wild symbol. It will replace all others, excluding bonus symbols, to help you bring in more wins. Spin three or more earthworm symbols on an active payline to trigger the worm races. This second screen bonus game will have you choosing your worm to compete for cash prizes. You'll get to try things out in the Qualifying Race, and then play for real in the Final Race.